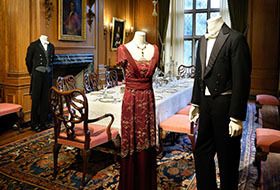 Dressing Downton™: Changing Fashion for Changing Times premiered in early 2015 at the renowned Biltmore estate in North Carolina before heading west to Oshkosh, where was exhibited throughout the rooms of the historic Paine mansion. 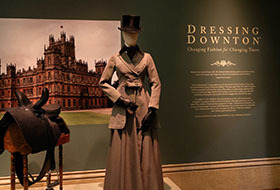 This stunning exhibition included 36 period costumes and a fashion overview from the first four seasons of the acclaimed PBS Masterpiece series Downton Abbey®. Downton Abbey is on track to become the most successful British drama ever aired, with numerous awards to its credit. The award-winning costumes showcase the styles of post-Edwardian England and the English country estate. Downton Abbey traces the lives and pursuits of the estate’s aristocratic inhabitants, the Crawley family, and their servants during the 1910s and ‘20s. Filming takes place at Highclere Castle, a fantastical country estate in Newbury, England. 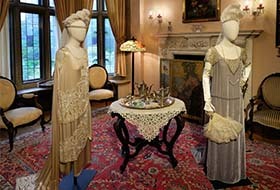 Dressing Downton explores fashions in Britain from 1912, marked by the sinking of the Titanic, through World War I and into the early 1920s, the dawn of the Jazz Age. Placing the costumes within their broader historical context, the exhibition focuses on this era of great change, showing the progression of fashions from the bustle to the flapper dress. The variety of ensembles for the Crawley family and their servants range from country tweeds and riding outfits, to servants’ uniforms and footmen’s livery, to delicate afternoon dresses and lavish evening attire crafted of sumptuous fabrics and decorated with intricate embroidery, lace and beading. The exhibition's award-winning costumes were produced by the London costume house of Cosprop Ltd. Since 1986, when the Academy Award for Costume Design was awarded to a Cosprop designer for A Room with a View, the company has supplied costumes for 29 nominated films. In 2011 and 2012 four of the five films nominated for Best Costume Design included costumes from Cosprop. Special thanks to Nancy Zieman and Wisconsin Public Television for producing these segments highlighting the exhibition. Exhibition produced by Exhibits Development Group in cooperation with Cosprop Ltd., London. Downton™ and Downton Abbey®. ©2015 Carnival Film & Television Limited. All Rights Reserved. The presentation of the exhibition at the Paine is sponsored by Jewelers Mutual Insurance Company. Major marketing support provided by Candeo Creative and the Wisconsin Department of Tourism with additional marketing support by Castle Pierce, Cumulus Broadcasting, Oshkosh Northwestern, and Wisconsin Public Radio. The exhibition is supported in part by the Oshkosh Area Community Foundation and the Wisconsin Arts Board with funds from the State of Wisconsin and the National Endowment of the Arts.